Kurt of Gerolstein: Dynamite's first explosion! Once upon a time, I raced horses. 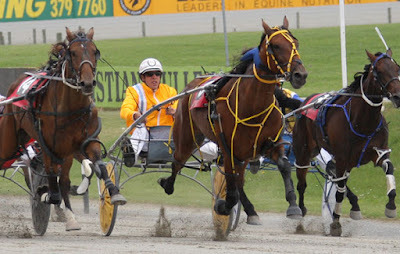 Harness horses. 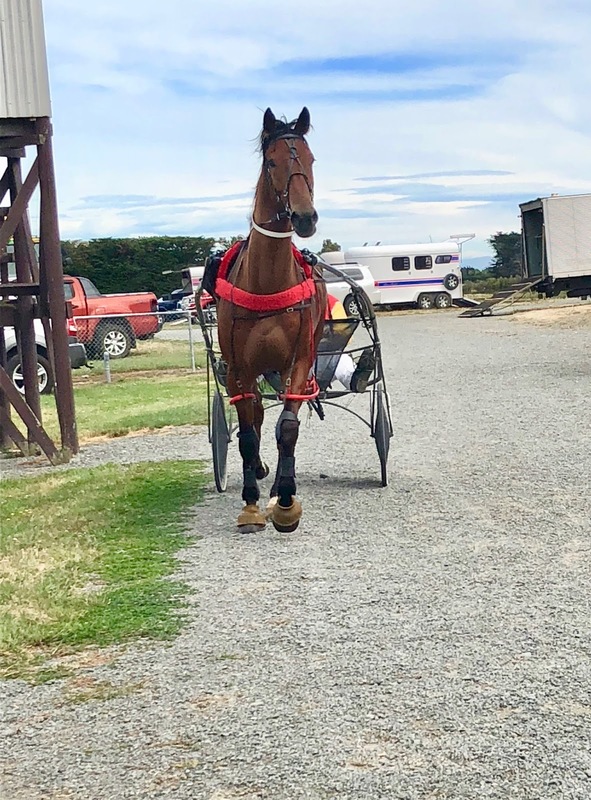 Quite successfully too, although of course little guys like I can’t compete against the monoliths of the New Zealand Harness Racing industry when the big prizes are at stake. It’s crumbs time. In the end, I suppose my 50-odd wins cost me something like $15-20,000 apiece. Finally, the gloss went off the game for me. All the things that were bad about racing in New Zealand seemed to be getting worse, and the nice things, the sporty things, the fun things were disappearing. Not to mention new rules, hugely increasing costs … it was time to go. So I went. I gave away my last three mares, Duchess, Elena and Agnes, found homes for the boys who had finished racing, as riding horses, and in the end was left with just two horses: huge, goofy Johnny Molecule, who has a congenital defect in a leg which would prevent his ever being a racehorse, and Elena’s baby, a handsome boy called Dynamite Paul (known as ‘Mister B’). I should, I suppose, have given him away too, but I didn’t. In the end, he went out in the paddock and just ate grass. 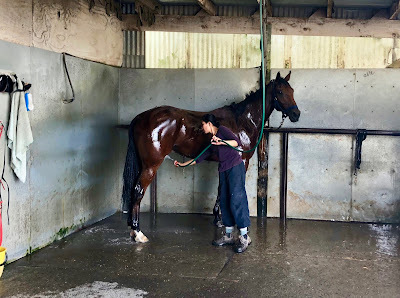 Then one day, three months or so back, a horsey gent walking past the greensward where Mr B was having his usual hoon said ‘wow, who’s that?’ ‘A trotter?’. Er no. A pacer. But Mr B was trotting. Could he be a trotter? I loved my trotters. There was only one way to find out. Off to Motukarara with him, to ‘Motukarara Murray’ Edmonds, who has trained nearly all my trotters. Well, like his mother and his Aunt Agnes, Mr B has a mind of his own. Also, he had never seen ‘a race’ and wasn’t initially quite sure, I’d say, what he was supposed to do. What he was NOT supposed to do was rear up at the barrier, and have a fit at the ‘ping’ of the starting tapes, close by his right ear. What he was NOT supposed to do was gallop off the mark and end up, in a twinkling, way behind the field. But then things changed. Mr B glid into his gait and set out after the others at a rate of knots. The gap disappeared in fifty metres as he cruised at an excessive speed up and right past the opposition, to lead the charge by several lengths. Well, he may have pretty useful speed, but Mr B is still a ‘learner’ as far as race manners are concerned. He’ll need a good few more similar practice runs before he becomes a racehorse. But I don’t mind. I actually enjoy workouts more than races, these days. Well, here we go again. Last time. Really...!